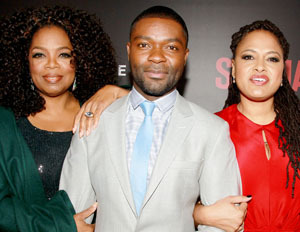 Oprah Winfrey and the cast ofÂ Civil Rights movie Selma planned to march in Selma, Ala., on Sunday, Jan. 18, according to Time.com. David Oyelowo, who stars as Dr. Martin Luther King, Jr. in the film, was reported to join the march, along with the director Ava DuVernay. The stars marched with Selma residents across the Edmund Pettus Bridge. According to Montgomery Adviser, Selma Mayor George Evans said, “‘I’m honored that Paramount Pictures and the cast has put Selma to the forefront of the nation again during MLK weekend. '” He says that Dr. King’s dream marches on. The celebration was set to start at Selma High School with a Q&A period moderated by Congresswoman Terri Sewell. Local high school students and teachers got to ask select filmmakers and cast questions regarding the film. At 4:20 p.m, Mayor Evans addressed the community at Selma City Hall, as Reverend Dion Culliver of Tabernacle Baptist Church and Reverend Leodis Strong of Brown AME Chapel welcomed the crowd with a prayer. The march followed at 4:45 p.m. The city continued the celebration of Dr. King on Monday,Â the official holiday in honor of theÂ Civil Rights leader,Â with two free screenings of Selma for the general public at 12:30 p.m. and 3:00 p.m. at the Selma Walton Theater, courtesy of Paramount Pictures. Selma has received rave reviews since its debut. The film, however, was only nominated for two Oscars. Critics and media outlets, including The Washington Post, have declared the lack of nods a “snub.” The cast and directors seem to still be in good spirits, however,Â continuing in their commemoration of Dr. King’s legacy. Oprah tweeted her 26.4 million followers that seeing the movie would be a great way to celebrate the weekend.